Following 12 hours of tense debate, Russia's State Duma has adopted amendments to the law on rallies, slapping harsher penalties on participants and organizers alike. A law imposing tougher restrictions on organizers and participants in unsanctioned rallies has passed the Russian State Duma. Should President Vladimir Putin sign the bill, it will affect the opposition-led “March of Millions,” scheduled for June 12. “I can say for sure that what is going on in the State Duma now is unprecedented for the parliament,” said a Kommersant FM radio reporter, launching his coverage of the debate about the amendments to the law on rallies. Many other journalists and political experts shared his opinion. The amendments adopted by the Duma impose much tougher penalties on participants in unsanctioned rallies. The bill raises maximum fines for participation to 300,000 rubles ($9,200) for individuals, 600,000 rubles ($18,400) for officials and 1 million rubles ($30,800) for companies. Furthermore, the bill introduces mandatory community service for offenders, prohibits wearing masks during rallies and imposes fines for unsanctioned assemblies of citizens, or “partying,” if the participants disturb the public peace. Also, the amendments ban citizens from staging public events if they have been fined two or more times for breaking the rules for holding rallies within 12 months. The State Duma discussion of the proposed penalties for those failing to comply with the rally and protest procedures resulted in a very unusual night session. The reason for the lengthy debate was the action staged by the members of the opposition Just Russia faction, which bombarded the Duma with hundreds of remarks. 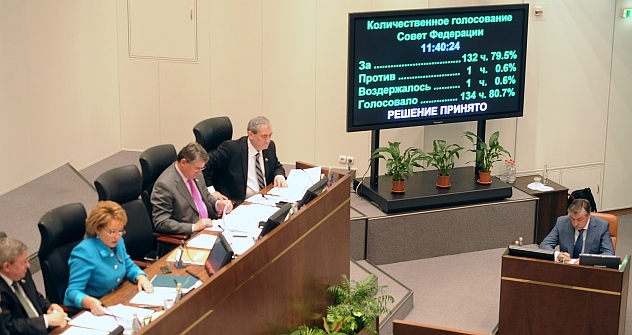 In a bid to speed up the vote, the Duma cut the standard time for considering a remark in half, to just 30 seconds, and the debate, which started at 12:30 p.m., ended a few minutes before midnight. Before voting on the bill after a third reading, representatives of the factions were allowed to make short speeches and opposition deputies warned the Duma that the sanctions might backfire. “The street won’t ever forget this,” said Just Russia leader Sergei Mironov promised those who backed the dramatic increase in fines. The warning did not affect the voting results, however, and, at 11:37 p.m., the opposition deputies ran out of remarks and the speaker put the bill to vote after a second reading. The vote was 239-207. A third reading was announced immediately after that and, at 11:50 p.m., the Duma adopted a new version of the Administrative Offenses Code and law on rallies. The upper house of the Russian parliament, the Federation Council, took less time to discuss the bill - that body adopted it by noon on Wednesday. The vote was 132 to 1, with one member abstaining. Putin could sign the bill by the end of the day on June 7. Presidential spokesman Dmitry Peskov believes that Putin “will consider all of the remarks he has received before making the final decision.” According to him, Putin will reject the bill only if it runs counter to the generally accepted rules applicable to rallies in foreign countries. “These are European states with similar regulations on rallies”, the spokesman for the president said. The opposition believes that United Russia wants the amendments in effect by June 12, when the opposition plans to hold its next mass rally. The article is based on the information from Kommersant and RIA Novosti. "The authors of the draconian amendments that have been adopted fail to notice that the participants in mass rallies already bear civil liability for damaging property or injuring people. By imposing additional administrative liability, the authors of the amendments disregard the rule precluding double punishment for the same offense." "First of all, we believe that such a significant document should not be adopted so hastily or timed for the scheduled mass rallies of pro-opposition citizens. If the amendments to the law that regulates the procedures for holding rallies and marches denies citizens their constitutional right to assemble, peacefully and without weapons, then protest moods will grow radical. The insufficiently elaborated bill might thus have precisely the opposite effect to that intended by its authors."